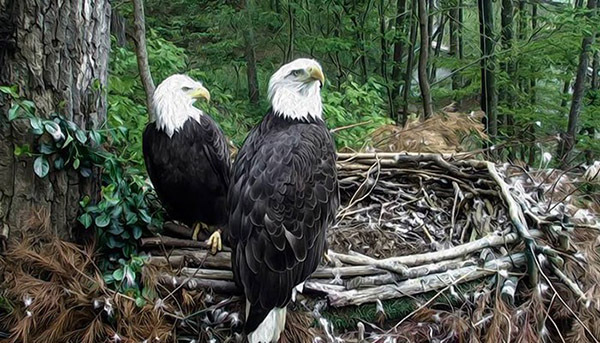 Eaglets wait for their unborn sibling. 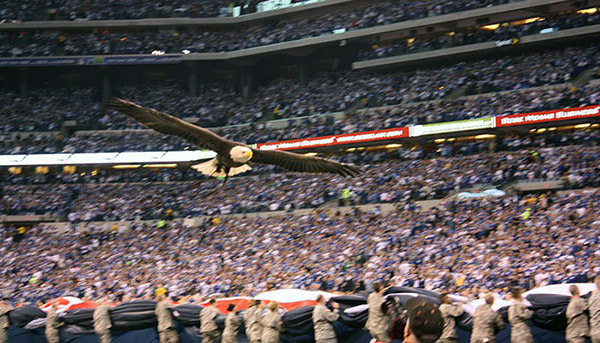 Challenger soars over a field size flag. 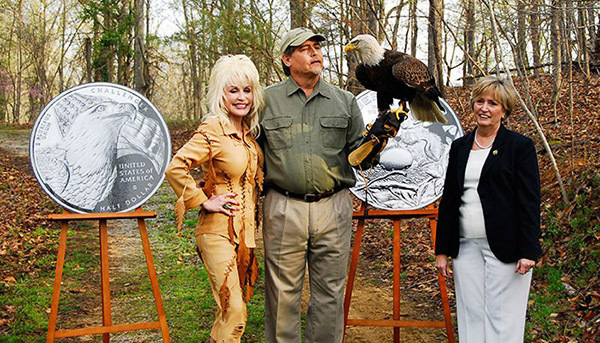 Dolly Parton helps promote the 2008 Bald Eagle Commemorative Coin Act. 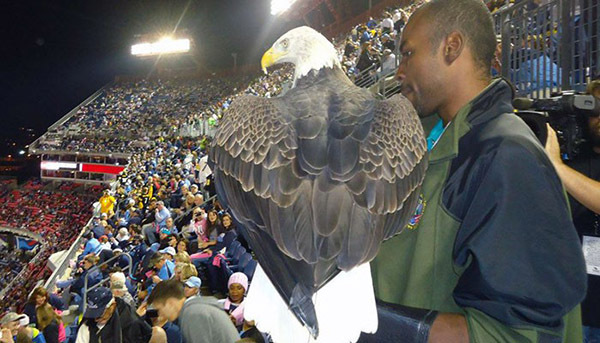 Challenger helps celebrate the removal of the Bald Eagle from Endangered Species Act protection. 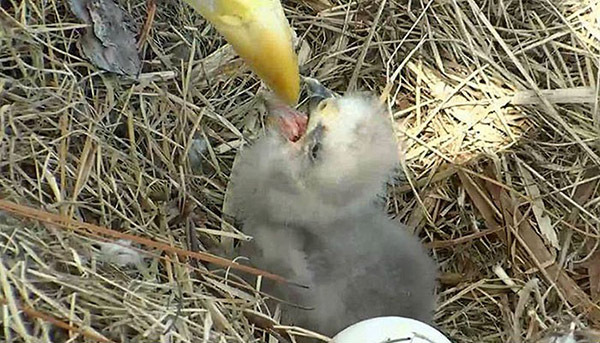 A newly hatched Eaglet receives a feeding. 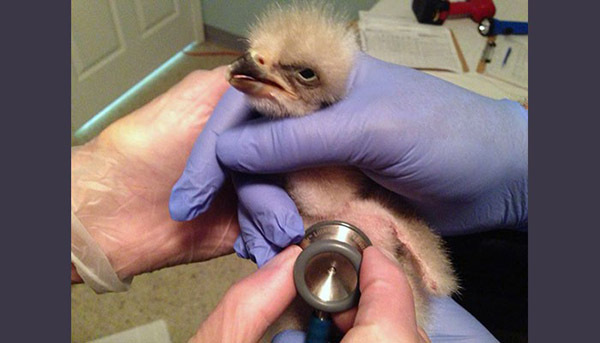 A newly hatched Eaglet gets a checkup. 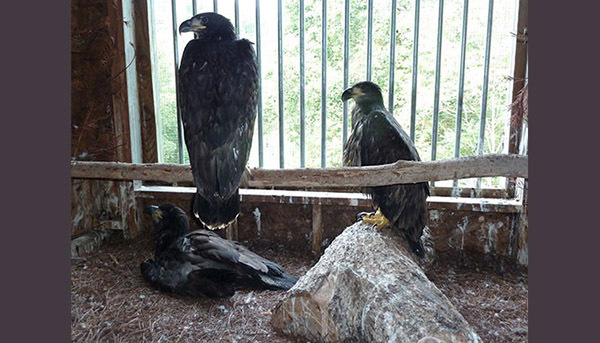 Three Eaglets in the AEF's hack tower grow strong in preparation for their first flights. 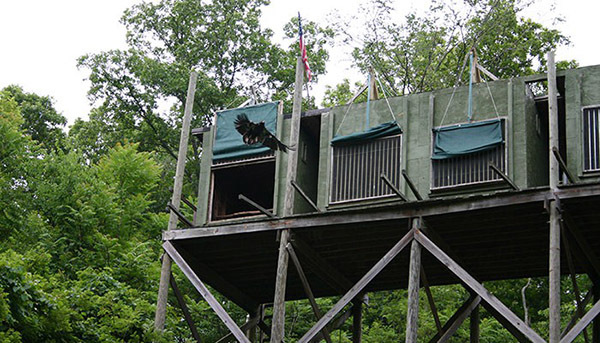 An Eaglet takes its first flight from the AEF's hack tower. AEF President Al Cecere releases a rehabilitated Eaglet back into its original nesting area. 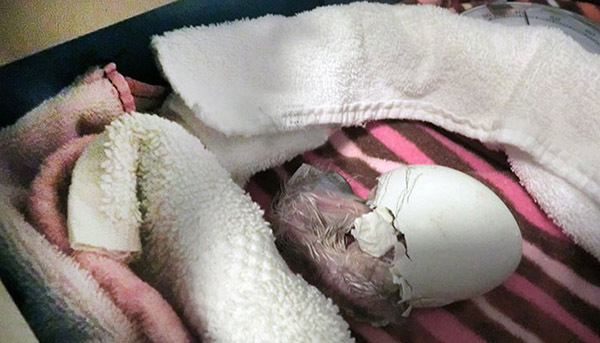 An Eaglet makes its way into the world. 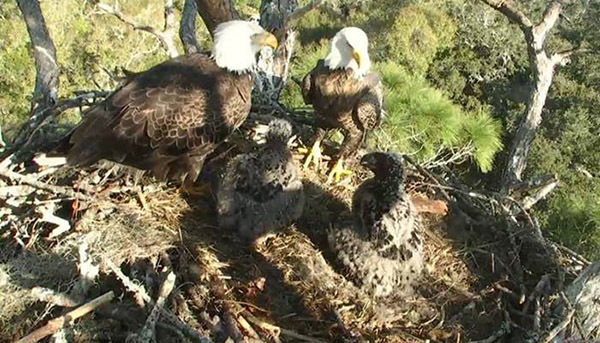 'Independence' and 'Franklin' enjoy the sunlight in Eagle Mountain Sanctuary. 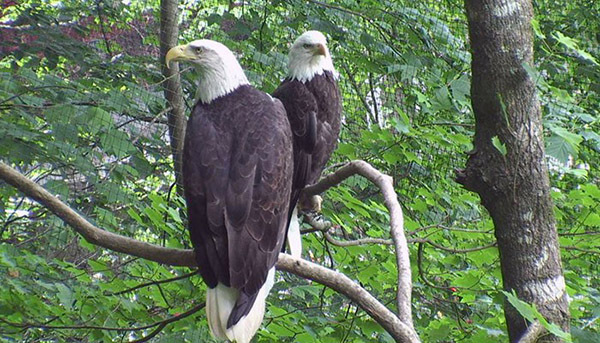 Eagle Mountain Sanctuary provides ample natural perching to its residents. 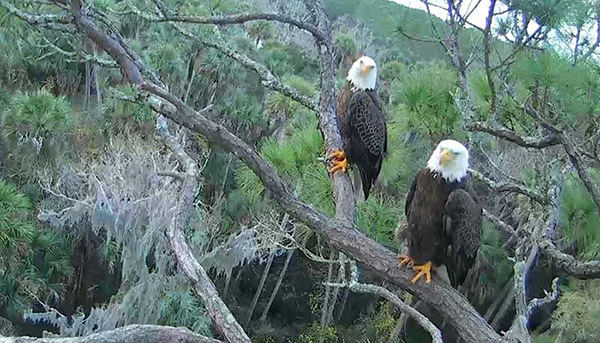 'Independence' and 'Franklin' sit atop their nest. 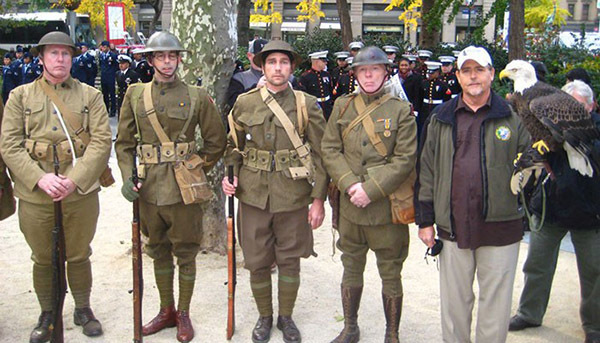 Challenger the Eagle and AEF President Al Cecere pose with servicemen. 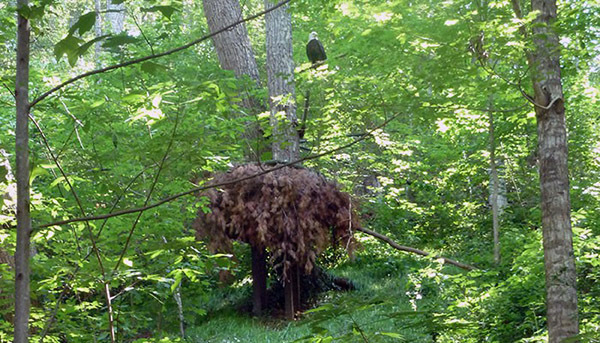 Eagle Mountain Sanctuary is home to three nesting pairs who hatch and raise eaglets each spring. 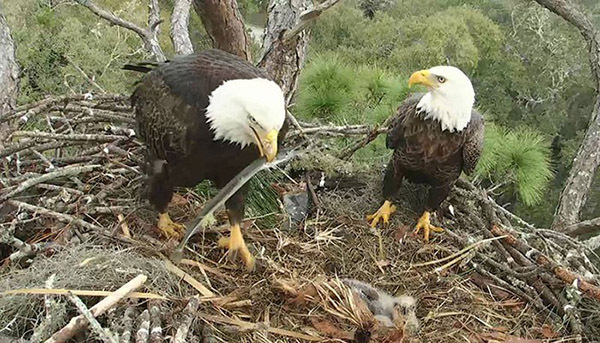 A newly hatched Eaglet receives a vital feeding before being placed with a pair of parent Eagles. 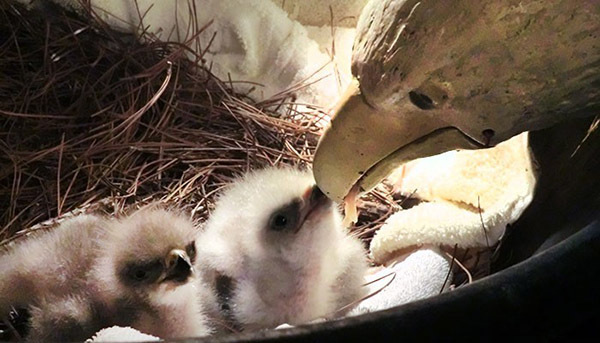 Newly hatched Eaglets receive a feeding by an Eagle puppet. 'Romeo' and 'Juliet' perch in their Slash Pine tree. 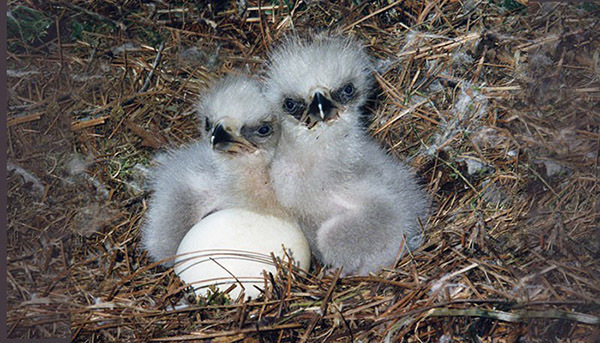 'Romeo' and 'Juliet' care for their newly hatched Eaglet. 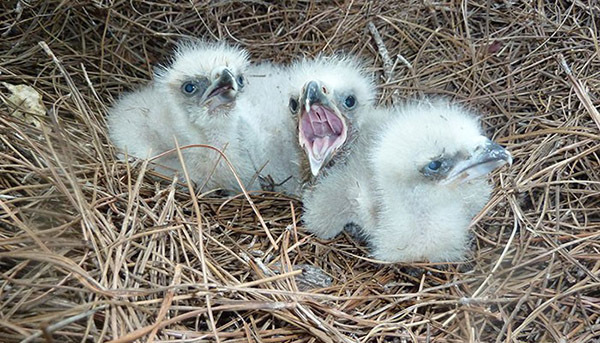 'Romeo' and 'Juliet' care for two feisty and growing Eaglets! 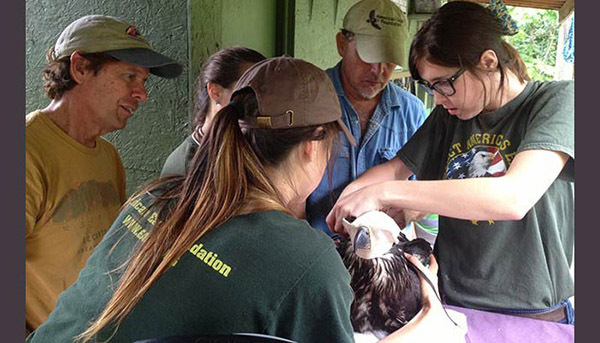 The AEF team places a solar GPS transmitter onto a juvenile Eaglet prior to its release into the wild. 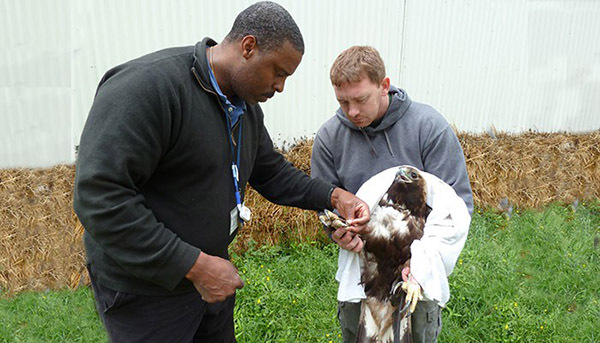 All AEF resident raptors receive annual checkups by a Avian Veterinarian. 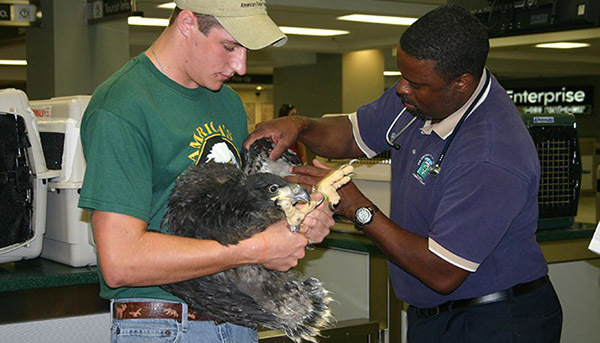 A juvenile Eaglet receives a checkup before being placed into the AEF's hack tower. 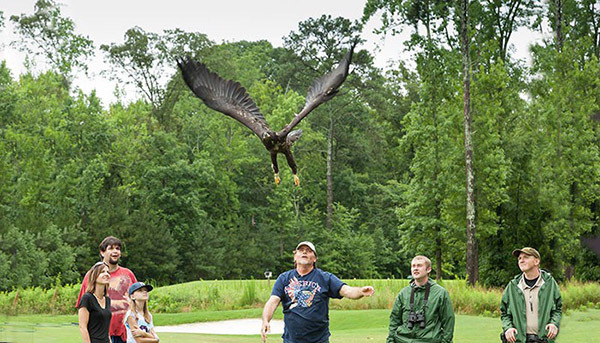 However, the AEF realizes that the effort to keep America’s Eagles Flying Strong and Free™ goes beyond its own reach, which is why the AEF aims to build a “Nest-Egg” for the future care and protection of Bald Eagles through larger scale fundraising efforts. This American Eagle Fund is earmarked for future public and private recovery efforts across the U.S. The American Eagle Fund may be funded by earmarked donations from corporations, foundations, organizations, and individuals. 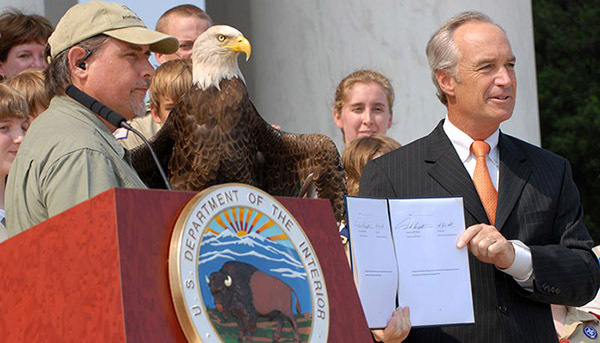 In 2003, the American Eagle Foundation secured approval from the Tennessee State Legislature for the development of a vehicle license plate honoring the Bald Eagle. Since then, tens of thousands of Tennesseans proudly display this special license plate on their vehicle, thereby promoting the cause of protecting the Bald Eagle. 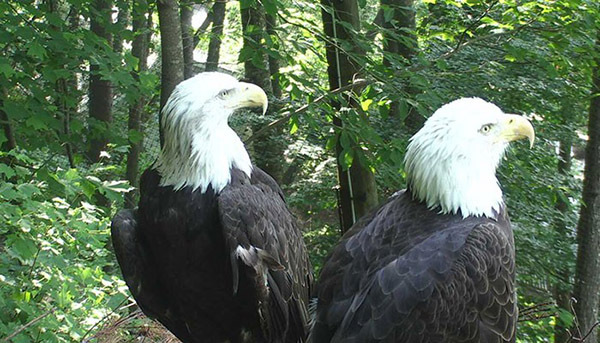 $35 of the yearly licensing of this tag is allocated to the American Eagle Foundation to be used exclusively for the preservation of the American Bald Eagle and its habitat. The AEF supports similar license plate efforts in other states. 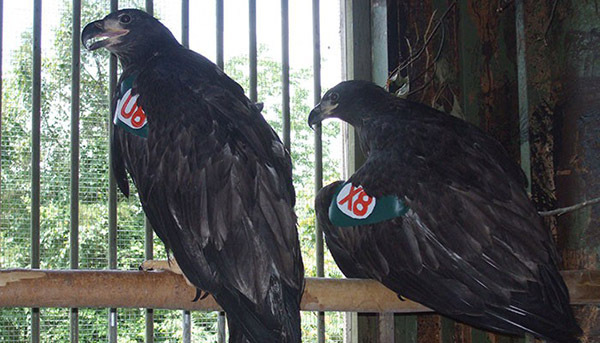 If you are a a raptor/wildlife organization and would like to partner with the AEF in sponsoring a license plate that contributes to the American Eagle Fund, please contact AEF president Al Cecere. In 2004, the U.S. Senate and House UNANIMOUSLY passed the “Bald Eagle Commemorative Coin Act.” Congress authorized the U.S. Mint to mint $5 gold, $1 silver and $0.50 clad commemorative coins which were sold to the public in 2008. The American Eagle Foundation continues to make those coins available to the public through its web site. These Coins celebrated the 35th anniversary of the Endangered Species Act of 1973, as well as the Bald Eagle’s successful recovery in the U.S.A. 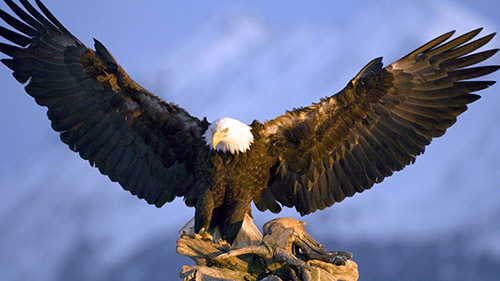 The Act authorized surcharges collected from the sale of collectible Bald Eagle Commemorative Coins to be paid to AEF of Tennessee “to further its works,” which includes grants for Bald Eagle Projects. This money rests in the American Eagle Fund.